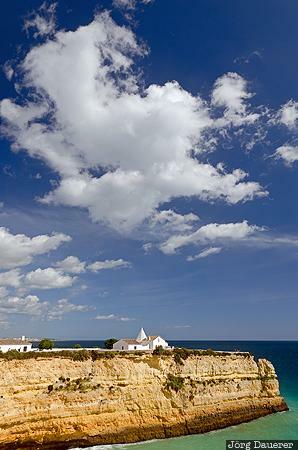 The chapel of Nossa Senhora da Rocha on top of the cliffs of the Atlantic coast at the Algarve below a blue sky with some clouds. The chapel is near Faro in the Algarve in southern Portugal. This photo was taken in the afternoon of a sunny day in March of 2011. This photo was taken with a digital camera.